Best ways to be successful at stock market trading. The company's shares Twitter on Friday on the back of good corporate news, increased in price. The stock price has overcome the nearest resistance 21 and fixed at the level of 22.53. The opening of the American market was accompanied by strong gap, the growth rate of Twitter shares. Such price gaps with such a strong force, as a rule, do not end the reverse movement. 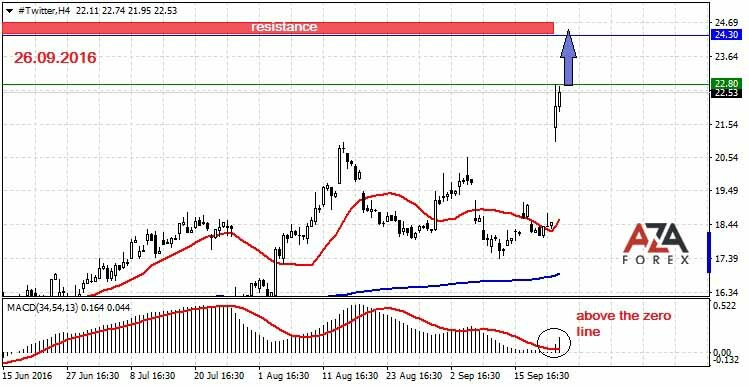 Relying on the second pulse, it is possible to buy shares in the breakdown of the resistance level of 22.80 with a worthy goal of 150 pips, where the price can meet resistance. Given that some sectors of the US economy, are still in a phase of growth, our prediction on the movement of Twitter shares can reach the goal. basic advice to know if you want success in stock market.